In 2014, Thomson Reuters began giving “Taxologist” awards to those who succeeded with their Tax Technology products. Now the term has adopted a broader meaning and labels a set of skills that are fast becoming as distinct as they are vital to tax function success. It’s time to treat them as such. The pace of change in the tax world, driven by technological advancement, is bewildering. Such is the impact that the basic expectation of a tax function is being quietly altered—as without mastery over technology there’s simply no way to keep up. Anecdotal evidence suggests concerns are growing. This is unfortunate, as by association the standing of the Tax professional is at risk of being eroded at the very time their organizations need the opposite from them. So, how have people and companies responded? Let’s take a brief look. The argument rages as to which route is better, but neither is ideal. While adequate to learn the tricks of the trade for a few specific Tax technology products, neither allows for one to gain sufficient grounding in the disciplines of the other to construct, oversee and govern large, complex end-to-end Tax solutions. A necessity at any large corporation or those with a structured org chart (which is almost everyone), but these new groups have a chequered history. They either struggle to distinguish themselves from IT or succumb to the temptation to dabble with technology. Their true purpose eludes them and only a few establish a viable basis for demonstrating their value. Outsourcing works best when there’s a firm handle on the what and how of the tasks being handed over. Too often, the discovery element (underestimated by the outsourcer) derails such arrangements. A similar outcome can be expected when the outsourcee is an in-house IT department and Tax adopts a hands-off approach. These pitfalls eventually leave the leadership frustrated and hesitant, as no amount of reshuffling the deck can compensate for an inherent skills gap. Let’s explore further. Starting with the obvious; no one doubts Tax is complicated, but then so is IT. Anyone who has ventured into projects knows that the distance between the two is far greater than might be imagined. At first glance, tax technology looks like it should be simple, yet it has repeatedly proved not to be so. The assimilation of technology into Tax is a non-trivial exercise. In truth, there’s an entire body of knowledge, concepts, principles and disciplines involved, and certain ground rules that must be established and observed. Without recognition of these fundamentals, initiatives are wrong-headed from the outset. Think of it this way. If a qualified Tax professional was the first of his or her kind to turn up at a multi-$billion international corporation, they would have much to do. Firstly, they would have to get their heads around the current situation, devise and formalize a business-level strategy, then agree and socialize it before finally putting in place the processes, tools and checks to execute it safely. Only then would the organization begin to reap the rewards. Fortunately, Tax experts have a fully tried and trusted profession to fall back on, giving them the wherewithal and respectability to pull this off. It’s time tax technology had the same. Et viola! The scene is set for Taxologists, or so you might think, and yet they barely exist today. Those that do exist are rarely deployed correctly, in part because until now they’ve defied definition and it’s unclear how to value one. Yet in most cases, it’s a highly-qualified, proficient Taxologist who is recognised as such, that is the missing link. 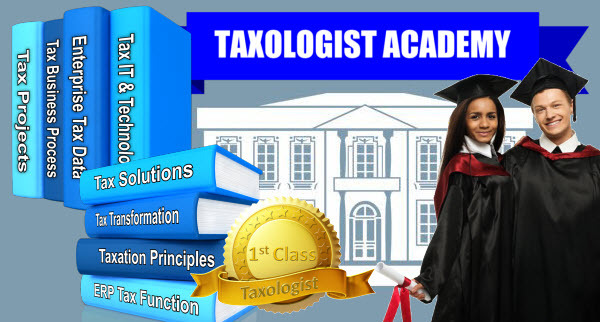 As yet, there are no three-year university courses for Taxologists. They have no professional bodies nor internationally agreed standards to which they must adhere. It will remain that way for some time to come. However, there is another option, the Smart Tax Technology Certification Program. Taxology and Taxologists may not yet be ready for the paraphernalia of a full profession, but that doesn’t mean they can’t start acting as one. As it becomes increasingly difficult to separate Tax from the technology that underpins it, the success of the tax function will rest on both the existence of professional-level Taxologist skills and the means to bring them to bear effectively in today’s organizations. Fortunately, there’s a way forward which brings early results within reach. See the Tax Technology Insight Series to learn more. Acknowledgement for Thomson Reuters who introduced the term “Taxologist” in 2014. Copyright: NejroN / 123RF Stock Photo.